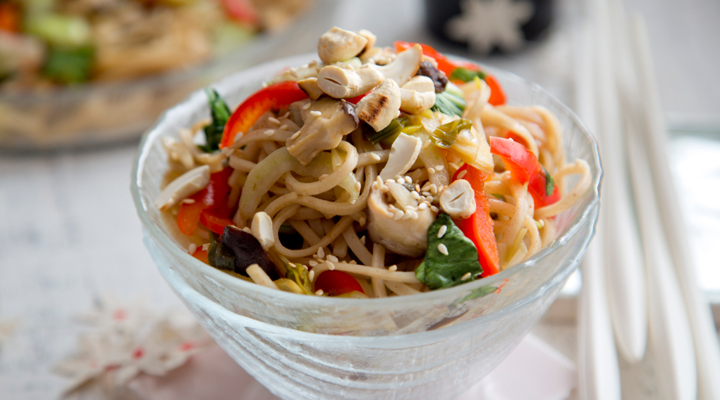 This is a fast, quick and easy noodle dinner that will go down well with the whole family. The shiitake or oyster mushrooms are worth seeking out, as they are quite ‘meaty’ and substantial and absorb flavour really well, but button mushrooms will do in a pinch. You might like to add some chilli to this dish and feel free to mix up the veg, but make sure they are fast-cooking veg such as sugar snap peas, peppers, cherry tomatoes, etc. Start by prepping all your veg, then boil the kettle. Pour the boiled water into a medium-sized pot and put it on a high heat to bring back to the boil. Add the noodles and cook as per the packet instructions. Meanwhile, add the oil to a large pan set over a high heat and let it warm up for 30 seconds. Add the spring onions, garlic and ginger and cook for 1 minute, then add the mushrooms and cook for 3 minutes, stirring regularly to keep things moving. Put the lime juice, soy sauce and maple syrup in a basic mug (like one you'd use for tea) and mix together with a fork. Add half of this sauce to the pan and cook for 2 minutes. Drain and rinse the noodles as soon as they're done, then add to the pan along with the rest of the sauce and cook for 1 minute. Add the baby spinach or finely chopped bok choy along with the red pepper and cook for a final minute. Garnish with cashew nuts, sesame seeds and some chopped coriander and serve straight away. If you’re watching your salt intake, use a low-sodium soy sauce.